Branford Hobbies | Your First Choice For Fun! 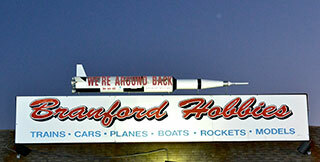 Look for the Rocket on the roof across from Eli's. We are around back to the left of Harley Davidson. Exit 51 (Frontage Road). Straight for 2 plus miles. Look for Honda, Harley Davidson, we are directly after on the right. Exit 54 (Cedar Street). Left at the end of the exit. Right at the light onto Route 1. Straight for 2 miles. We are on the left just before Harley Davidson around back.